The online booking feature allows new and existing patients to book recare and other types of appointments online. Recare patient communications. Patients receive email and text message reminders with the option to book online. No roaming providers. Providers must be assigned to always work in certain operatories. Online booking offers open time slots to a patient based on which operatories providers can be scheduled in. Set up or modify recare types. Ensure that the intervals and attached procedures are correct and that the Primary Recare Type check box is selected. For each location, verify that the information is correct, and upload a logo. These will be seen by patients. For each provider, verify that his or her user information is correct, and upload a photo. These will be seen by patients. For each location, set up the appointment reasons for online booking. For each location, set up the default appointment lengths for online booking. For each location, set up the available hours for online booking. For each location, enable online booking. For each location, set up or modify patient communications. Ensure that there is at least one active recare email reminder. In the sample email messages for your active recare email reminders, you should see a Book Now button. On the website for each of your locations, use the HTML provided by Dentrix Ascend to include a link to the online booking website for that location. Tip: To view your progress with getting a location completely set up for online booking, with the correct location selected, select the Schedule Template option on the Settings menu to open that location's Schedule Template page, and then click (or tap) Setup Progress. When the patient receives an email or a text message reminder, he or she clicks (or taps) Book Now (for an email message) or the link (for a text message). The patient is taken to the online booking website and sees available times for dates spanning from the recare due date to two months after. When the patient of record or a prospective patient visits your location's website, he or she clicks the link to book an appointment online. The patient is taken to the online booking website. The patient selects whether he or she is a prospective patient (New) or a patient of record (Existing). The patient selects an appointment Reason and a Provider (if known, and the patient has a preference). The available appointment time slots (if any) appear based on which time blocks allow online booking for the specified Patient type, Reason, and Provider. Open times that don't conflict with appointments and events that are already scheduled appear. Open times that are at least as long as the default appointment length for the appointment (based on the recare appointment type, new patient appointment reason, or existing patient appointment reason) appear. A patient is trying to schedule a 60-minute appointment. You have openings from 8:00 AM to 11:00 AM and from 1:00 PM to 2:00 PM in the applicable time block. The patient will see availability only for 8:00 AM and 1:00 PM. After the patient takes the 8:00 AM time slot, the next patient will see availability only for 9:00 AM and 1:00 PM. When you create, move, or delete an appointment or event, the change is published to online booking within 30 seconds. When you inactivate a provider or an operatory, it is purged immediately from online booking, and the corresponding hours are removed from the available hours setup. Nightly, online booking automatically searches for openings for the next several months. Changes to online booking hours is published nightly. Office hours are not taken into account. The patient selects an available time slot and then clicks (or taps) Book now. Within 30 seconds, the patient is informed that the appointment has been booked or, if there is an error, to call the office. If an "appointment scheduled" patient communication has been set up, the patient will receive that notification. The patient enters his or her name, birth date, phone number, and email address; optionally types comments for the office; and then clicks (or taps) Verify. 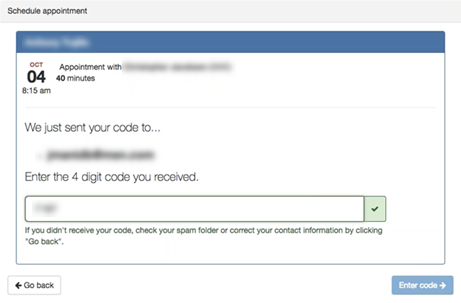 Dentrix Ascend sends the patient an email message with a verification code, which the patient must enter to finish booking the appointment. Within five minutes, the patient is informed that the appointment has been booked or, if there is an error, to call the office. If an "appointment scheduled" patient communication has been set up, the patient (even if he or she is a new patient) will receive that notification. The appointment tile has a booked online (cloud) symbol to indicate that it was booked online by the patient. 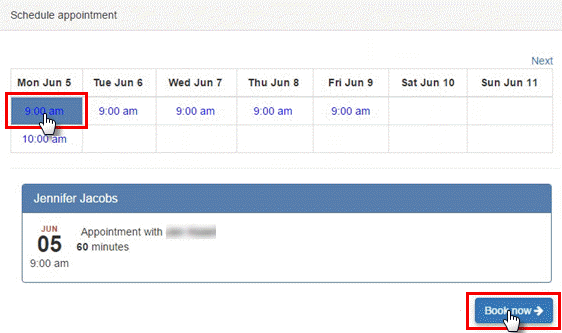 Tip: You can also identify appointments that were booked online by generating the Appointments Booked Online Report. On the Appointment Information panel, the appointment has the "Booked Online" text and symbol in the upper-right corner. On the Appointment Information panel, the appointment has an Unconfirmed status. On the Appointment Information panel, the appointment has a recare procedure attached (recare appointments from email and text message reminders only). 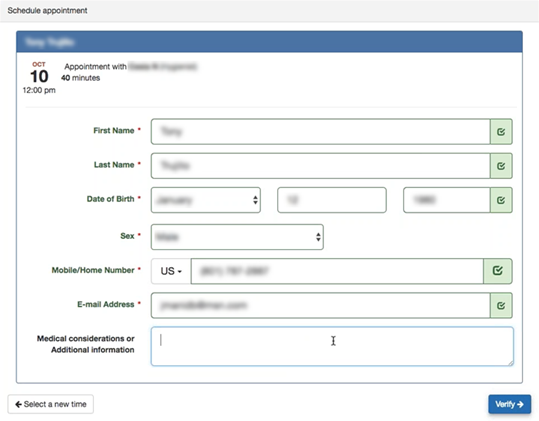 On the Appointment Information panel, the appointment reason appears in the Other box (new patient or existing patient appointments from website links only). On the Appointment Information panel, the appointment has a note that the appointment was booked online by the patient and when it was booked. It also includes any comments from the patient. If the patient for the appointment appears to be new or is not a perfect match for an existing patient on record, Dentrix Ascend asks you to verify the patient. 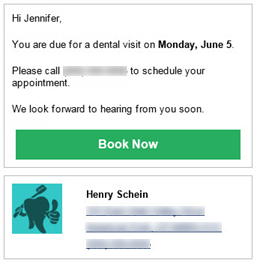 When verification is needed, a symbol appears in the upper-left corner of the appointment tile to indicate that the booking needs to be assigned to a patient. Click (or tap) one of the possible matches (if any are listed; up to two may be listed). Text and numbers in red indicate the differences between what is in Dentrix Ascend and what the patient entered online. Note: If your organization has multiple locations, Dentrix Ascend shows possible matches only for patients whose preferred location is a location that your user account has access to. Click (or tap) Search for another Patient to view additional matches or to use the search box to find the correct patient. Click Create New Patient to create a new patient record and keep the patient's information attached to the appointment. Note: Each time a patient books an appointment online, a corresponding entry is added to the audit log. do we get an email notification when a patient books an appointment online? Also, it looks like the SMS reminder has a txt regarding online booking with a link that doesn't work. No email notification is sent when a patient books online. I don't think there should be a link to book online in the SMS reminder. I'm pretty sure this feature is currently only for email reminders. Please contact Support to resolve -- post a comment in the community forum, send an email, or call. 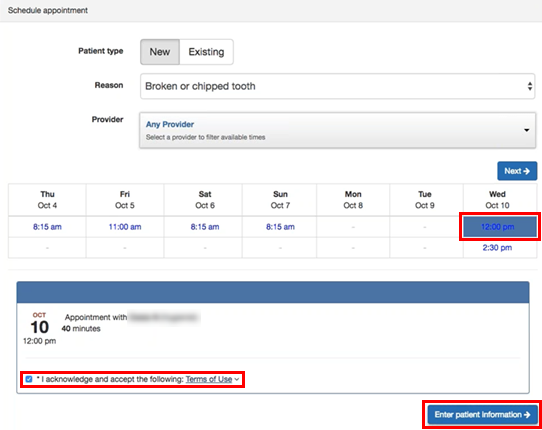 so how do we know when a patient has booked an appointment online? we have to be logged on ? that doesn't seem very practical. we use zocdoc as our current online booking tool, and they send an email to us right away when an appoinment is made so we can confirm it. we try to confirm within the hour no matter what time it is. without any notification when a patient makes an appointment it could be days (worst case) before we see the booking.